Dr. Saima Mushtaq expansively touches all aspects of acute viral meningitis at sqadia.com. Starting off with clinical manifestations and etiology, CSF examination and viral culture also comes under debate. 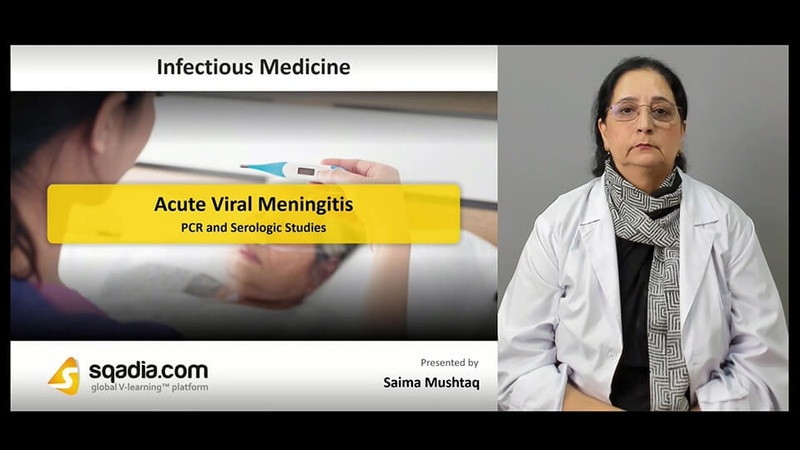 PCR and serologic studies are also discussed along with specific viral aetiologies. Lastly, information about antivirals is given. 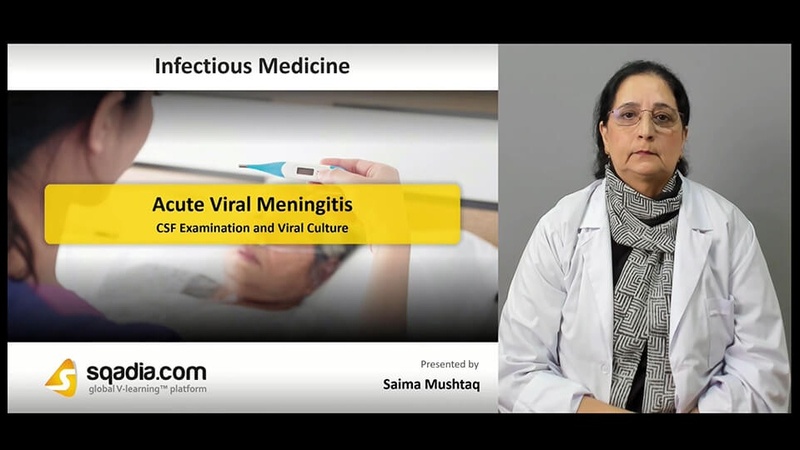 To know about acute bacterial meningitis, stream the full length lecture on sqadia.com. Immunocompetent patients present with clinical manifestations of headache, fever, signs of meningeal irritation. Constitutional signs correspond to malaise, myalgia, anorexia. Etiologically, viruses causing acute meningitis are enteroviruses, varicella-zoster virus (VZV), arboviruses, human immunodeficiency virus. Total CSF cell count in viral meningitis is 25–500/μL. After that, normal and decreased CSF glucose concentration is elaborated. Markers of specific viral infection include neopterin, quinolinate, β2-macroglobulin. For viral culture, specific viruses are isolated from throat swab, stool, blood, and urine. Enteroviral infections may persist for several weeks. Polymerase chain reaction amplification is used for the diagnosis of CNS viral infections. Amplification of viral-specific DNA or RNA is carried out. Serologic studies are done for many arboviruses including WNV. Viruses with high seroprevalence are VZV and HSV. Other laboratory studies follow complete blood count and differential liver and renal function tests, c-reactive protein, and neuroimaging studies. Among specific viral aetiologies, enteroviruses are the most common cause. It is sporadic or occur in clusters. Arbovirus infections are common mainly in summer and early fall. HSV meningitis is the major cause in adults. VZV meningitis is suspected in presence of chickenpox or shingles. Moreover, information about EBV Infections, HIV meningitis, mumps, and LCMV infection is also delivered. Treatment is carried out by the use of analgesics, antipyretics, antiemetics, and fluid & electrolyte status monitoring. Hospitalization is advised if encephalitis and parenchymal brain involvement is seen. 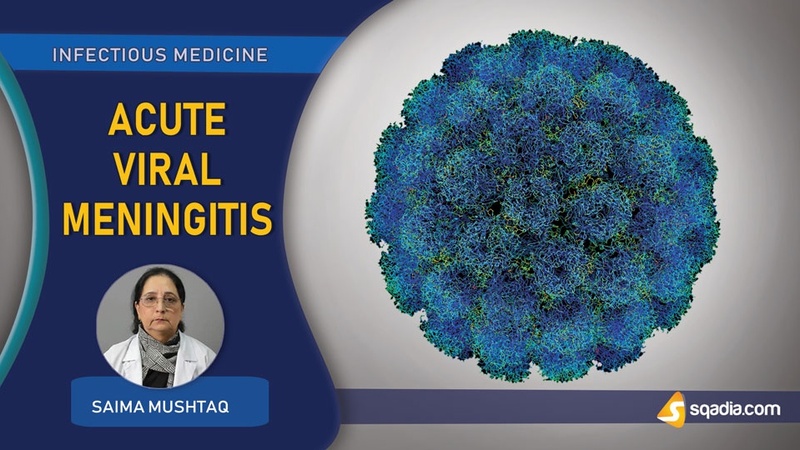 For HIV meningitis, highly active antiretroviral therapy is prescribed. There is no specific therapy for arboviruses.